The phrase “loosely based on” has never been more appropriate than when used to refer to “Big Hero 6,” Disney’s animated family movie. Its ultimate source is a Marvel comic-book series, but Robert L. Baird and Daniel Gerson have taken the basic premise and turned it into something quite different, sweetening the tone and accentuating the humor. The result is a movie that, especially in the first half, is basically a genial, good-natured boys’ adventure; and if it stumbles somewhat in the second hour, when it becomes more derivative and action-oriented, it remains likable to the end. This version of the title, set in a colorful amalgam of San Francisco and Tokyo called San Fransokyo, begins with fourteen-year old Hiro Hamada (voiced by Ryan Potter), an engineering whiz who graduated from high school early the year before, shunning further studies in favor of hustling competitors at underground robot-fighting meets. His parents are dead, and he lives with his Aunt Cass (Maya Rudolph), a café owner, and his older brother Tadashi (Dennis Henney), a university science student anxious to get the kid onto the right path. Tadashi brings Hiro along to the campus lab and introduces him to his fellow students GoGo (Jamie Chung), Wasabi (Damon Wayans, Jr.) and Honey Lemon (Genesis Rodriguez), as well as to Fred (T.J. Miller), a slacker hanger-on. Most importantly, however, Tadashi arranges a meeting with his mentor, the great Professor Callaghan (James Cromwell), who encourages him to audition for admission to the school. Seized by a desire to join Tadashi’s class, Hiro invents the micro-bot, a tiny pin-shaped entity that can be ordered to join with millions of its fellows to make up whatever its master telepathically commands. Though entrepreneur Alistair Krel (Alan Tudyk) offers big bucks for the device, at Callaghan’s suggestion Hiro refuses to sell it, preferring instead to continue developing it in the university lab. Unfortunately, a fire and explosion soon destroy the place, and in the conflagration Tadashi dies. A bereft Hiro falls into depression, lifted only by the intervention of Baymax (Scott Adsit), a puffy vinyl caregiver robot that Tadashi has been working on and had programmed to his brother’s wavelength before his death. Baymax, who looks rather like a cross between the Pillsbury Doughboy and the Michelin Man, becomes the reluctant boy’s companion, and the movie’s comic centerpiece as certainly as Robin Williams’ Genie was in “Aladdin.” But he’s very different from Disney’s earlier motor-mouth, hyperactive creation. Childishly literal and obsessively attuned to serve Hiro’s physical needs, Baymax is like a puffy nanny, tottering about on balloon-like legs when he doesn’t have to be stuffed back into his case for battery recharging. And his naivete and eagerness to please become a source of gentle amusement. The interaction between Hiro and Baymax will be the movie’s main attraction—just watch for the running gag about their fist-bumps, which remains fresh even when repeated. So far, so good. But after fifty minute or so, “Big Hero 6” goes back to its source with the introduction of a super-villain, wearing a kabuki mask, who has gained control over Hiro’s micro-bots and is manufacturing many more. His identity and ultimate purpose are unknown, though it’s immediately suspected that he’s the greedy Krel, but his malevolent designs on the boy quickly become clear. 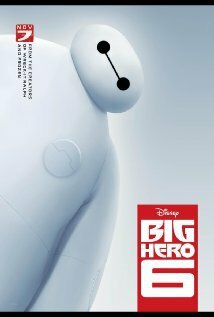 So Hiro improves Baymax’s programming to transform him into an armored, high-flying superhero with a master’s prowess in karate. And when Tadashi’s friends show up, he uses his programming skills to give the four of them super-powers as well. With him, that makes for the titular sextet. The key to the film’s second half is the confrontation with the unnamed villain, during which his identity and motivation are of course revealed. All of the six heroes are engaged in the fight, but the major part of it is Hiro’s collaboration with the new, improved Baymax—he’s propped on the big fellow’s shoulders as he goes through his paces, honing his talents and encouraging him to fight on. The obvious inspiration is “How to Train Your Dragon,” which “Big Hero 6” comes to resemble closely in these action-oriented segments. As a result it grows increasingly conventional, losing some of its early charm in the process. But happily enough remains to keep it aloft, though not at the altitude it once possessed. “Big Hero 6” is blessed with attractive animation, in terms of both the characters and the backgrounds, that’s enhanced by the 3-D format rather than becoming a slave to it. The voice work is excellent, too, though frankly the females—Chung, Rodriguez and even Rudolph—come across as rather pallid compared to Miller’s Fred, Wayans’ Wasabi, Potter’s Hiro and especially Adsit’s delightful Baymax, whose singsong delivery, together with the visual rendering, proves utterly winning. The score by Henry Jackman, expanded with some pop tunes at critical points (like the inevitable montages), is by contrast fairly ordinary. But that’s hardly a serious flaw. It doesn’t take a Nostradamus to foresee sequels on tap here, or perhaps a cable television series of the sort spun off from “Dragon.” One hopes that the offshoot will be able to preserve the cheerful mood of the first part of this movie, and not devolve further into conventional superhero mode. In theatres, by the way, the picture is preceded by a delightfully imaginative short called “Feast,” a nearly wordless montage about a rambunctious dog that enjoys sharing meals with its bachelor owner and reacts disagreeably when the guy finds romance, but eventually comes to appreciate the new situation. It tells a simple but touching story in a few deft strokes, and provides an exceptional curtain-raiser for the feature—which doesn’t represent too much of a let-down from it. There have been innumerable comedies about arrested-development type guys, so it only seems fair that there should be a few gender-reversal ones. But it’s a pity that Lynn Shelton’s “Laggies” is just as feeble as most of its male-oriented brethren are. Keira Knightley, acting as broadly as the star of any network sitcom, plays Megan, a young woman approaching thirty who’s at a stand-still in her life. Though she has a degree in psychology, she’s put off taking a position in her field and instead just spends her days standing on the curb with a sign advertising the tax-related business of her dad (Jeff Garlin). She lives with a blandly attentive long-time boyfriend, a photographer named Anthony (Mark Webber). And she still hangs out with her coterie of high-school girlfriends, headed by the overbearing Allison (Ellen Kemper). Megan is discontented, but doesn’t quite know why. Her unsatisfactory circumstance is brought home by a double whammy at Allison’s wedding. Megan glimpses her dad in a compromising situation with a woman other than her mom. And Anthony suddenly proposes. Thrown into a dizzy, she rushes off, ending up at a supermarket where she agrees to buy some beer and wine for a quartet of teens, among them Annika (Chloe Grace Moretz), with whom she spends a few hours. That persuades her that she needs time to think over what to do with her life, so she impulsively tells Anthony that she’s going off to a seminar, while actually planning to crash with the amenable Annika for a few days. It doesn’t quite work out like the stealthy sleep-over Megan and Annika plan, however. The girl’s father Craig (Sam Rockwell), a divorced lawyer who’s also a divorce lawyer, quickly discovers the interloper sleeping on the floor of his daughter’s room. But despite reservations he allows her to stay anyway. During her sojourn Megan helps Annika and her friends deal with their problems—broken homes and infatuations most notable among them—while eventually facing up to her own. Needless to say, there’s also time for her and Craig to develop feelings for one another. One might feel a little bit queasy over the idea of a thirty-something woman trying to find herself by essentially becoming a high-schooler again, at least in terms of the people she chooses to hang out with. But Andrea Seigel’s screenplay overcomes the charge of creepiness, at least partially, by turning Megan into a kind of surrogate mother to Annika—taking her to visit her actual mom (Gretchen Moll) to achieve a kind of closure, for example—although it’s possible to wonder whether a woman so confused about herself could be much help to a girl ten years her junior. But the real weakness of “Laggies” lies in its capitulation to what are little better than sitcom conventions, which are often dished up with a casual cruelty that people tend not to notice. (Note: Spoilers follow. Read on at your own risk.) One might wish for Megan and Craig to get together, for example, but the peremptory treatment of Anthony, who as played by Webber is a bit of a dunce, is pretty appalling. And when at Megan’s urging Annika, at the school prom, tells the boy she’s interested in about her feelings, he simply dumps his date and dances with her. Fine for Annika, but what of that faceless girl who’s now watching the new couple? This is a movie that wants to say something about the difficult process of maturation, but in the end it’s pretty juvenile itself. One can, nevertheless, glean some enjoyment from a few of the performances. Not Knightley’s, which involves far too much scrunching up of the face and flamboyant gesturing; but Rockwell’s easygoing demeanor, though familiar from previous films, is welcome, especially since Seigel’s script provides him with some scenes he can really toy with. And Moretz redeems herself somewhat after “If I Stay.” The jury may still be out as to whether she’ll successfully graduate to adult roles, but the evidence here is on the positive side of the ledger. “Laggies” is an independent film, and while a distinct step up technically from Shelton’s ragged mumblecore entries, it lacks the slickness of big-budget Hollywood product, though Ben Kasulke’s cinematography is perfectly decent and the other behind-the-camera contributions adequate as well. But though the packaging retains a bit of indie grunge, in terms of content the picture isn’t all that far removed from typical studio romcoms—and to be frank doesn’t rate higher than the middle of the pack.